This slow cooker shredded chicken takes just minutes to get started, and results in perfect, easily shredded chicken in just a few hours. So my recipe for you today is barely even a recipe. It’s so simple I’m not even sure I can call this a real recipe. 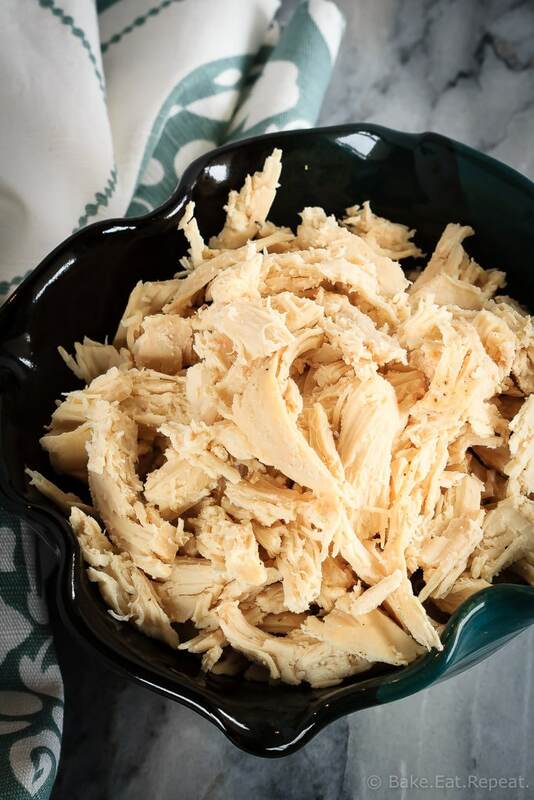 But I’m sharing it anyways, because I was pretty happy when I discovered this super simple way to make cooked, shredded chicken in the slow cooker. I use this method all the time, both to use the meat right away in a recipe that calls for cooked chicken, as well as to freeze for future fast and easy meals. And I figure there are plenty of people out there that still haven’t discovered this, so here you go. This is definitely the best way to make shredded chicken (in my humble opinion). It’s beyond simple. Place a couple (or 3 or 4 or however many you want) chicken breasts in the slow cooker, sprinkle them with salt and pepper, and add some chicken broth. That’s it. Wait a couple hours, shred it up with a couple of forks and you’re good to go. 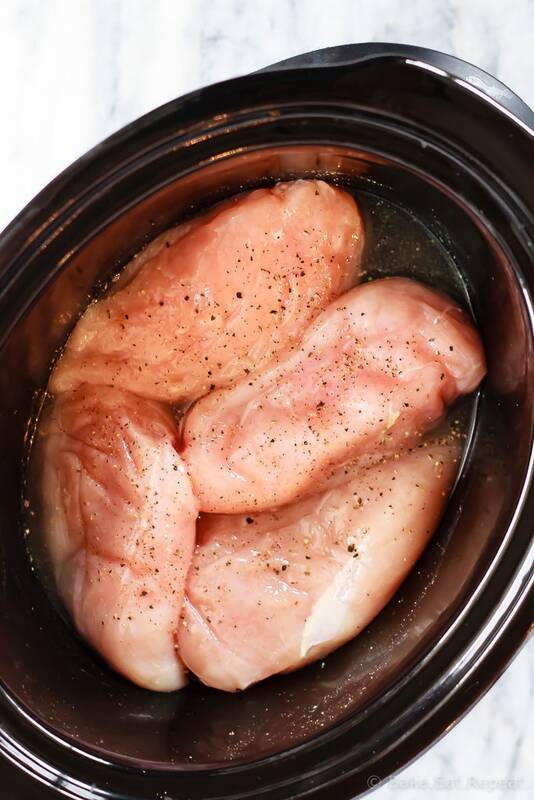 I make this slow cooker shredded chicken on both the low and high settings in my slow cooker, and haven’t noticed a difference in the results. I base it on how much time I have. It turns out well either way. The cooked, shredded chicken also freezes beautifully, so I tend to make a double (or triple) recipe every time I make this so that I can store some in the freezer for super quick meals on those busy weeknights. A few of our favourite recipes to use this slow cooker shredded chicken in are this buffalo chicken pizza, this 30 minute chicken noodle soup, this chicken pot pie, or this curried chicken salad. What’s your favourite recipe to use cooked chicken in? Send it to me – I have lots of chicken in my freezer to use up! 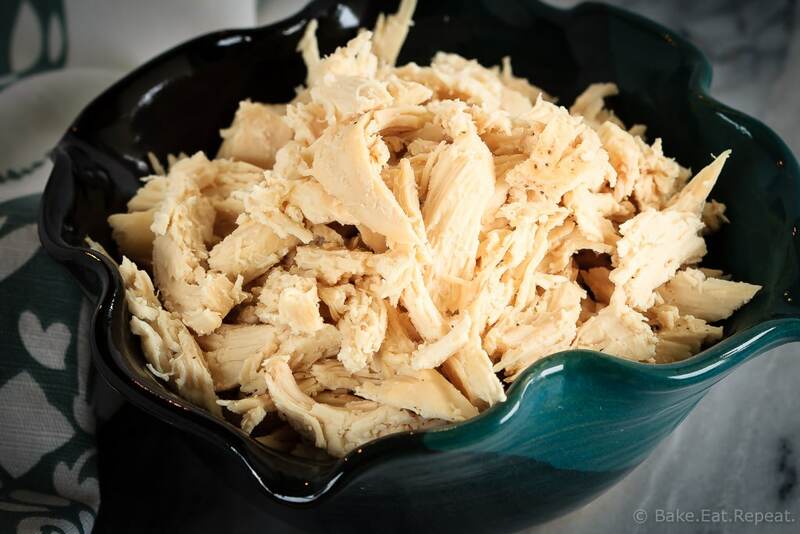 I’ve also shared this Slow Cooker Shredded Chicken Recipe over on Food Fanatic. If I want 6 pieces do I put all in at once and increase water/stock to 1 cup? Thanks! Yes, that's what I would do! Since you have frozen the slow-cooker chicken just add it to your dish just enough time before serving for it to rewarm. You don't want to re-cook it and lose the juiciness of the chicken. Cook a few pounds then throw it into the mixer. Use the paddle attachment & it will shred in under a minute. Bag & freeze what you don't need immediately. Does the recipe change if the chicken is frozen? Hi Vicki - I wouldn't recommend it as it's actually considered unsafe to cook meat from frozen in a slow cooker, as there's the risk of harmful bacteria contaminating the meat before it reaches a safe temperature. It's safer to thaw the chicken first!